This entry was posted in Art, Bliss Tips, Illustrations, Ink and Watercolor, Pets, Watercolor and tagged Art, golden retriever, golden retriever puppies, Mary A Livingston, puppy, Sneaking Bliss by MaryALivingston. Bookmark the permalink. So precious! Thanks for sharing. No snow here. It was in the 70s in NC today! This was a few weeks back, the snow’s all gone now. We hit 62 today. Thanks, Helen. Puppies are so much fun. I’m really enjoying following the spontaneous line and wash. So give yourself permission to play with art, you’ll be amazed where it takes you. You have great subjects to play with. And dogs don’t care if their portrait is not exact. Puppies are great subjects, but they move fast! Such a lovely painting, full of joy! Great movement, wonderful shadow, love this! The girls and I totally agree with you. 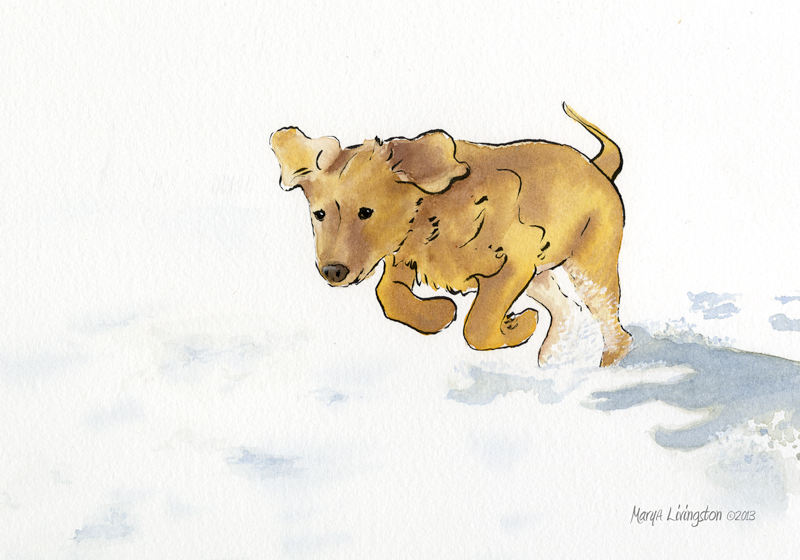 Very nice painting of Kinta romping in the snow. Great job on his front paws and ears too! Very cute and refreshing, in more ways than one.